We are happy to make something special just for you; all you need to do is get in touch. We decorate pebbles to order, such as place settings for weddings, parties and special presents. 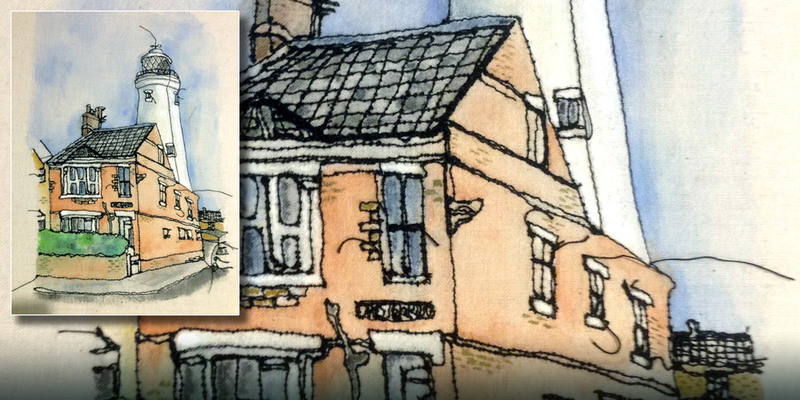 We also create one-off textile images and items. For example a free machine embroidered picture of your house or favourite landmark. Click the arrows or directly on a thumbnail to explore the images above. Individual letter pebbles, around 50 - 60mm. £3.00 each plus p+p and VAT. 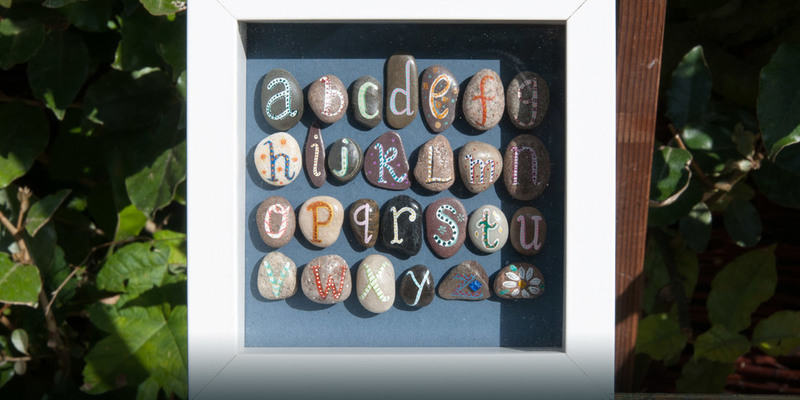 Order a set of pebbles that spell out a name or special word. Tell us what colours and type of decoration you prefer, or leave it up to us. Get in touch by email to discuss what you want. We will try to match the set of pebbles by size, but by their very nature pebbles do vary in shape and thickness. It's the variety that makes them interesting. Pebbles are hand-painted and sealed. Individual letter pebbles, around 20 - 25mm. £1.50 each plus p+p and VAT. Spell out a name or special word, from our stock or to order. Tell us what colours you prefer, or leave it up to us. Individual shell letters, around 20 - 25mm. Make up words or someones name as a special present. Tell us what colours or leave it up to us. We will try to match the set by size, but by their very nature these shell fragments do vary in shape. It's the variety that makes them interesting. Fragments are hand-painted and sealed. We can create a unique stitched picture of a building or landscape of your choice. From £40 plus p+p and VAT. Size ~ up to 30cm. Mounted and framed or left unframed. Working from a photograph or drawing, each picture is produced by free machine stitching onto fabric and then hand tinted with water colours. We will give you a firmer costing once we've spoken to you and seen the image you supply.